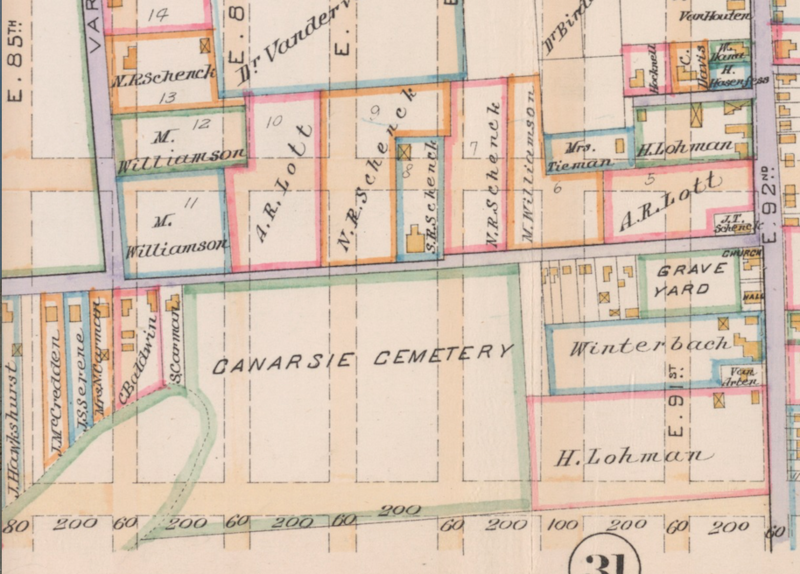 In 1656, officials of New Amsterdam considered the necessity to establish a new cemetery to replace The Old Graveyard that was located on the west side of Broadway around present-day Morris Street. 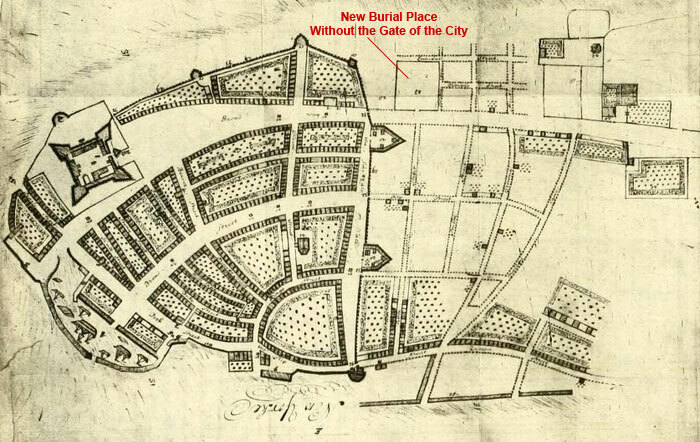 Exactly when the new graveyard was created is uncertain, but the 1686 Charter of the City of New York identified “the new burial place without the gate of the city” among a list of public accommodations belonging to the municipality. 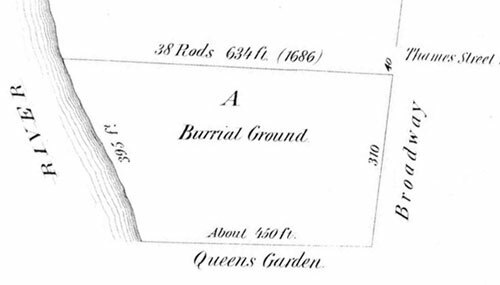 This burial ground is shown on the 1695 Miller Plan of New York (above), situated on the west side of Broadway just beyond the city gates that were located on Wall Street. 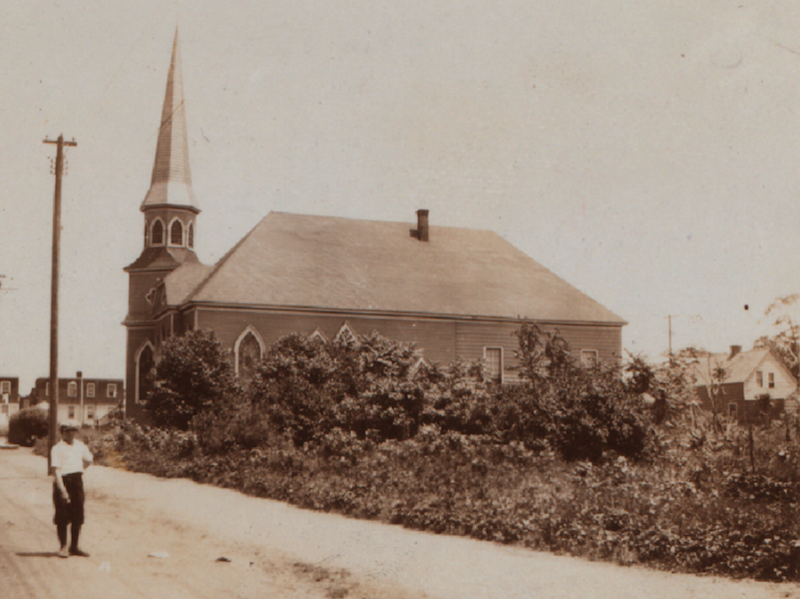 In 1703 the city conveyed this parcel of land to Trinity Church, which had, in 1696, purchased land adjacent to the burial ground to establish their church. 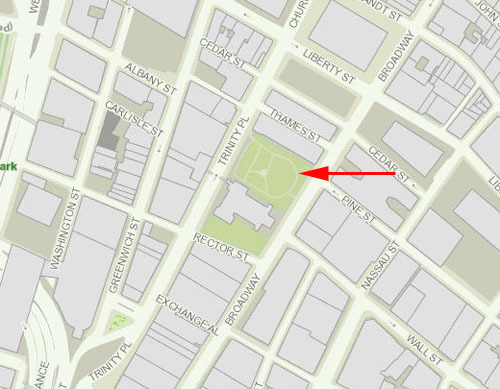 The city transferred the graveyard to Trinity on the condition that it be used as the “publick Church yard and burial place of this Citty for Ever.” It is contained in what is today the northern portion of Trinity churchyard, between Wall Street and Pine Street. When there was a proposal to extend Albany Street through the northern portion of Trinity churchyard in 1847, a report opposing the extension described the burial ground. It is nearly a century older than the other sections of the yard. 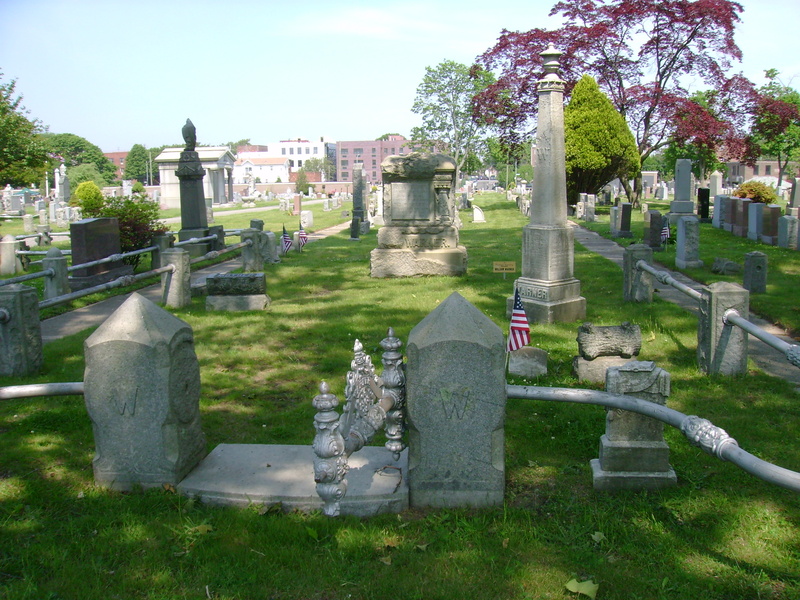 It was originally a valley, about thirty feet lower at its extreme depth than the present surface, and has undergone successive fillings, as the density of interments rendered it necessary, to raise the land until it reached the present surface, so that the earth now, to a depth of several feet below the original and thence to the present time of interment, is in truth filled with human remains . . . The bodies buried there were those of many thousand persons of several generations, and of all ages, sects and conditions, including a large number of the officers and soldiers of the Revolutionary War, who died whilst in British captivity; and almost every old family that is or ever was in this city, has friends, relatives or connections lying there. Sources: The Iconography of Manhattan Island 1498-1909 (Stokes 1915) 1:Pl23); Records of New Amsterdam from 1653 to 1674 (City of New York 1897) 2:24-25; Charter of the City of New York, 1686, reprinted in The Memorial History of the City of New-York (Wilson 1892), 437-446; Ecclesiastical Records, State of New York 2:1134, 1180; Minutes of the Common Council of the City of New York, 1675-1776 (City of New York 1905) 2:221; Treatise Upon The Estate and Rights of the Corporation of the City of New York (Hoffman 1862) 2:176-177, Diag. 2; NYCityMap. 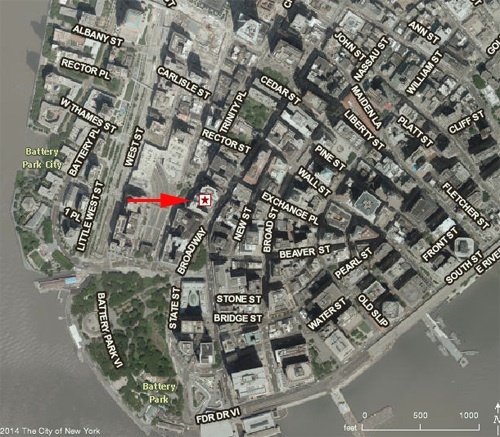 The earliest known cemetery of colonial Manhattan was located on the west side of Broadway, around present-day Morris Street. 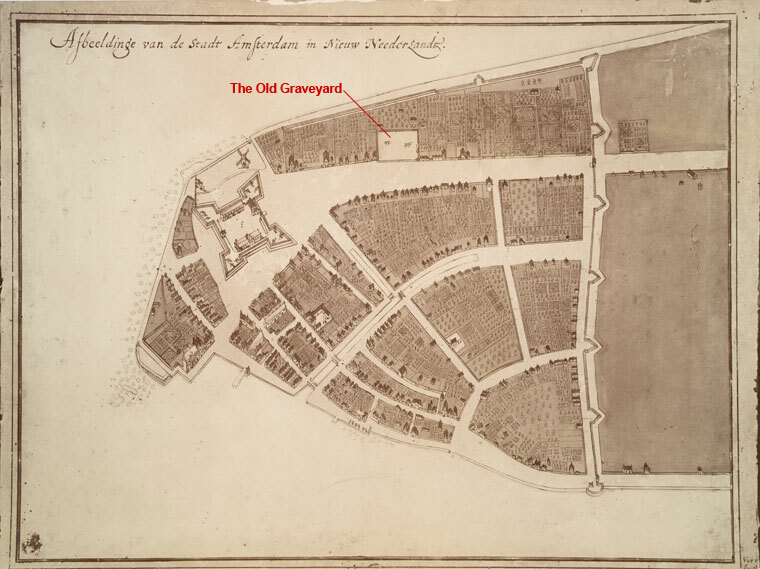 It is unclear when it was first established as a burial ground, but by 1656 it apparently had been in use for many years as it was referred to in Dutch records at that time as “The Old Graveyard, which is wholly in ruins.” The Castello Plan of New Amsterdam in 1660 (above) shows the cemetery’s location along the west side of the main highway that later became known as Broadway. 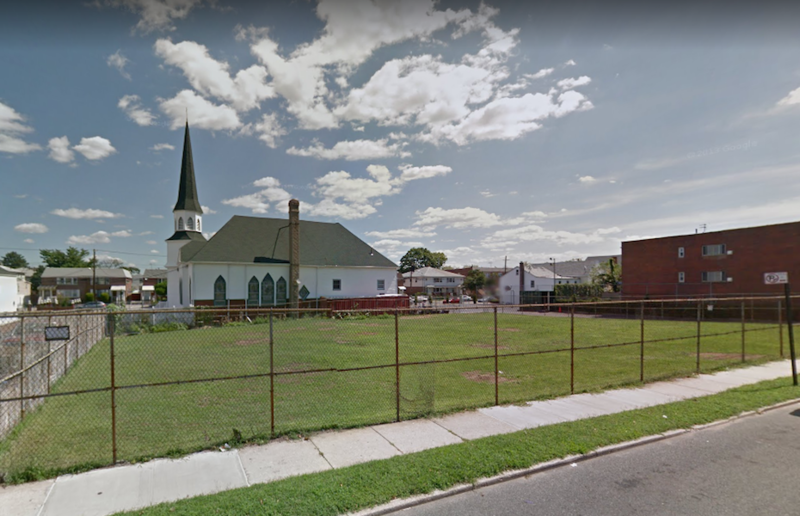 The dilapidated condition of the Old Graveyard was cause for concern again in 1665, when city officials described it as “open and unfenced, so that hogs root in the same.” In 1676, the city ordered that the cemetery be broken into lots and sold at auction. 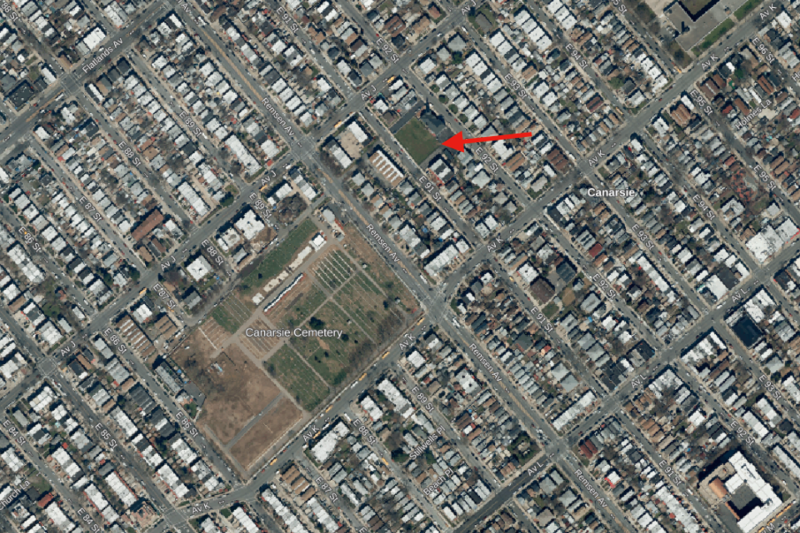 What happened to the burials in the Old Graveyard after it was disposed of by the city is unknown. 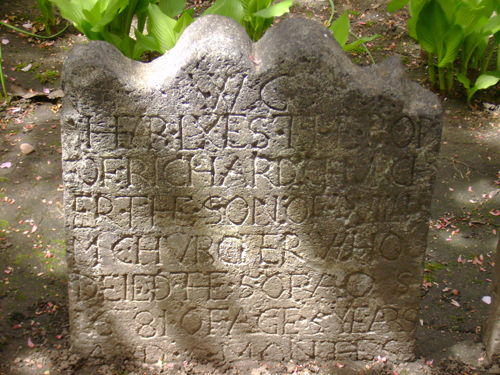 It is possible that the graves were moved to the new burial place that had been established further north along Broadway at what is now the northern end of Trinity churchyard. 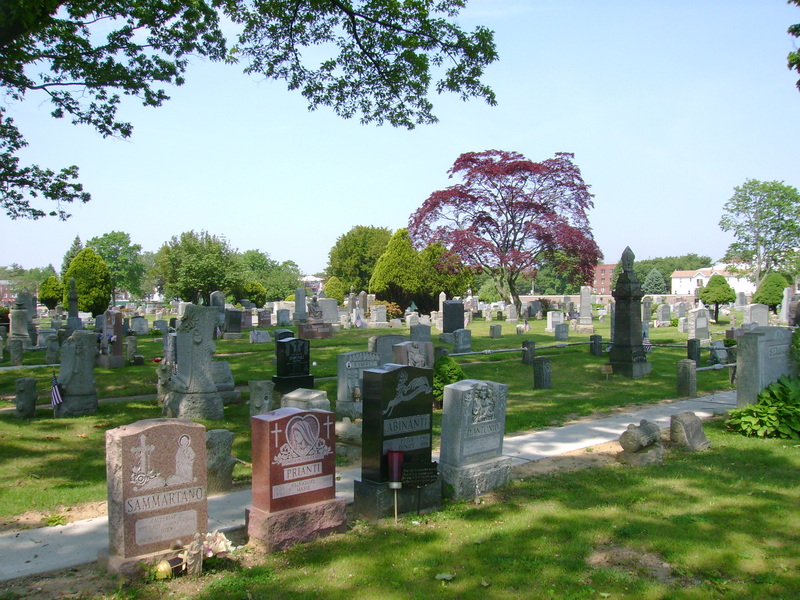 A more likely scenario (and one that is seen repeatedly for the city’s later public cemeteries) is that the graves were left in place and the area filled in before the land was reused. Evidence of the Old Graveyard was discovered in the mid-1800s when workmen uncovered human remains while excavating cellars in the area. Today, the high-rise office buildings that cover the site have obliterated all signs of this early colonial graveyard. 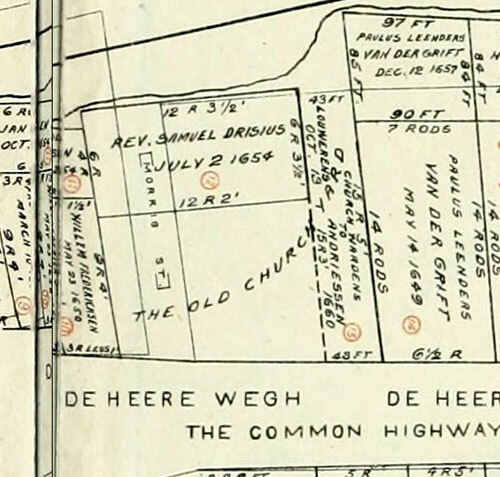 Sources: Records of New Amsterdam from 1653 to 1674 (City of New York 1897) 2:24-25, 5:253; Minutes of the Common Council of the city of New York, 1675-1776 (City of New York 1905) 1:47; Manual for Corporation of the City of New York for 1856 (Valentine 1856) 444-447; The Iconography of Manhattan Island, 1498-1909 (Stokes 1915-1916)1:Pl.10A; 2:221-222, Pl. 87; NYCityMap.